These colleagues helped us dive into this powerful topic. Our 15th twitter chat began on Wednesday, April 5th and continued to Thursday, April 6th. This #hmichat was focused on giving impactful scholarly presentations! • What was inspirational about the best presentation you attended? • What do you consider challenging when presenting your scholarly work? • How do you make use of collaborators in presenting scholarly work? 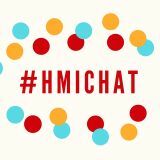 • How can we, your HMIchat peers, help you with your scholarly presentation? These questions and more drove an interesting discussion. Please leave your feedback below! We hope to improve the value of these reflections. Join our Harvard Macy community for the next tweet chat starting May 3rd at 9 pm EST. scholar Meg Chisolm for a great chat. ​How do you characterize/define humanistic medicine? What needs- if any- exist around current teaching & practice? Technology is a double-edged sword—how have you used or observed others use digital tech (e.g., the EHR, social media) to help teach and practice humanistic medicine? ​What opportunities exist- moving forward- to further harness digital tech for teaching/practice of humanistic medicine? 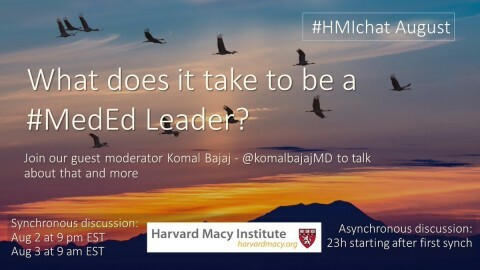 What was discussed during this month's #HMIchat on #reflection in #meded? Were there any surprises? How was the tweet chat "flow"? #HMIchat February 2017 brought together the Harvard Macy & KeyLIME communities to discuss social media scholarship in medical education. Our facilitators were Drs. Kristina Dzara, Kathleen Huth, and Jonathan Sherbino. For this second #HMIchat reflection, we invited Dr. Anna Cianciolo (editor of Teaching and Learning in Medicine) to add her perspective. Please leave your feedback below! We hope to improve the value of these reflections. Please join our Harvard Macy community for the next tweet chat on March 1st at 9 pm EST. Humanism in Medicine; hosted by Meg Chisolm.